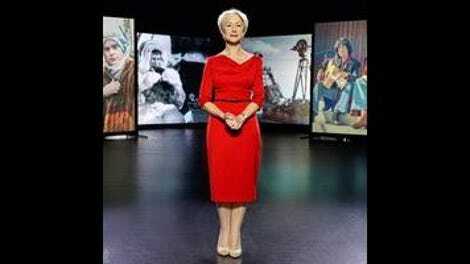 These days, we’re in a fascinating uncanny valley of cynicism when it comes to the documentary: perpetually interested in the truth as documentaries suggest it, but so aware of the manipulation that goes into a narrative that mockumentaries can often be as illuminating on a topic as the real thing. We’re also currently in something of a boom for the dramatically faux niche comedy, from Drunk History to Another Period, though there was a hole in the market for anyone willing to take an educated swing at the greats. So if you’re in the mood for a mockumentary that doesn’t skew to the sitcom, and that pays homage to real documentaries, and Garth Marenghi’s Darkplace is too much of a time commitment, you might as well try Documentary Now! 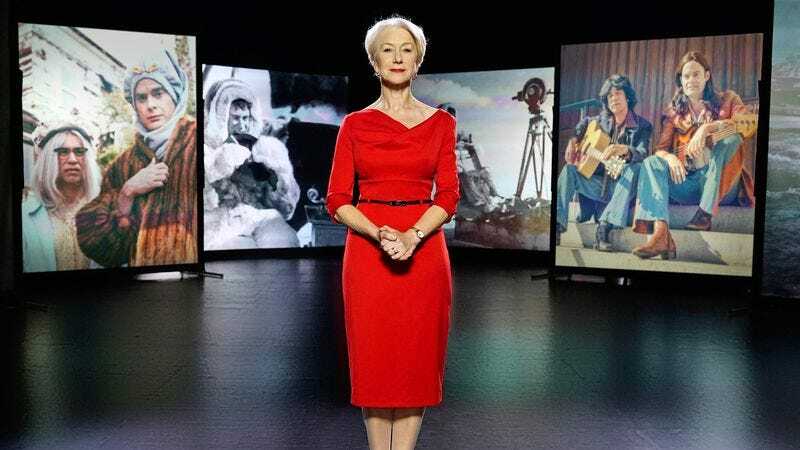 The show’s targets—iconic documentaries and the genres they’ve influenced—are fair game enough, and it has the stylistic trappings cold, right down to Helen Mirren lending sublimely straight-faced PBS self-seriousness to the episode introductions. (The show, one hopes, has more plans for her—any TV show that needs deadpan comedy could use a little more Helen Mirren, and she’s already right here!) And since creators Bill Hader, Fred Armisen, and Seth Meyers are all old hands at sketch comedy, there’s a palpable confidence in the show’s energy. The upside: Even in its early episodes, Documentary Now! establishes much of what it likely wants to do. The key to enjoying the show is excitement for what that is, which so far seems to be: See how long Hader, Armisen, and their co-stars can hang out inside a big-budget SNL skit before it has to insert a genre twist, develop a plot (about 15 minutes, as it happens), and add some surprise. There’s also a not-insignificant concern that without being familiar with the source material, the details won’t land, which would be a minor concern in a spoof that draws more widely. But when you’re spoofing Grey Gardens as precisely as this show does, the audience will have to have done its homework. Presumably, this show’s viewers will be self-selecting. Still, it’s no surprise that the network chose its Vice parody to go up online before the premiere. It’s the most straightforward riff of the bunch, but with such fertile ground for satire, there’s no real twist—or background knowledge—necessary. The “Dronez” doc-within-a-doc squarely mocks start-up-culture media as several doomed sets of hipster reporters are sent blind into the field, blundering self-righteously around Mexico with middle-school Spanish language skills in search of a drug baron. Its classic structure and sharp skewering of bro journalism speaks for itself, and Hader and Armisen positively revel in their reincarnated loathsomeness. The other targets of the season’s first half—Nanook Of The North and Grey Gardens, the latter retitled “Sandy Passage” with the sort of freshman-year frat-skit glee you might as well get used to—are so well-known that each needs something of an outside plot twist to sustain half an hour. Folding in more than meets the eye adds a layer of commentary to the parody, with mixed results: the showbiz in-jokes are charming enough but can feel slight on the heels of the more organic moments. Of the three episodes screened for critics, “Kunuk Uncovered” aims highest, and feels as if it could have used more space to polish some of its inside beats, though the blandly smiley it-was-just-the-era racism screw-yous are so good that they might be worth the price of admission. What stands out so far isn’t so much the familiar format but the energy of the actors. Armisen, of course, has perfected his wide-eyed affect amid the straight-faced absurd. But the standout of this series looks to be Hader, who manages the subtle, even affecting trick of making several of his subjects characters rather than caricatures. Hader’s work in The Skeleton Twins was a reminder of his caustic edge, and he makes good use of it here; even when other aspects feel unpolished or one-note, Hader singlehandedly makes any scene he’s in worth watching. Sure, he clearly relishes a chance to deliver a note-perfect parody of Grey Gardens’ Little Edie (what comedian wouldn’t? ), but what makes the performance fascinating is that he never forgets the pathos underneath the eccentricity that made Little Edie iconic. It’s a performance so good it accidentally highlights one of the episode’s more awkward subtexts: Documentary Now!’s twist on the source is largely to resolve the complicated disquiet of the original with a version that’s easier to laugh at, and so falls slightly flat. Luckily, that doesn’t seem to be the case across the board. A key to the series’ success and longevity will be how well it’s able to balance the insider spoof with the satire and offer moments that do more than just painstakingly re-create; moments that remind us of the absurdities of the form and the ways we’ve been trained to see through a story. That clever remove, whenever it appears, elevates things from sketch to something more chewy. They suggest a show that’s got a little heft behind the comedy, a little edge behind the jokes. And maybe a little more Helen Mirren, if you will.